Discussion in 'Nintendo 3DS Guides' started by InsaneNutter, Feb 28, 2016. This tutorial will tech you how to transfer a Game Boy save game from either a real Game Boy cartridge or emulator to the virtual console version of that game on the Nintendo 3DS. Although this should work for any Game Boy game which has a virtual console released on the 3DS i'm going to focus on the original Pokemon games. Later this year when Pokemon Moon and Pokemon Sun are released you will be able to transfer Pokemon from from the virtual console versions of Pokemon Red, Blue, Yellow or Green to Pokemon Moon and Pokemon Sun. This is the first time you will have officially been able to trade Pokemon from the first generation games to the current generation. If you have never played the original Pokemon Red, Blue, Yellow or Green this is likely not a major thing, however if you have your original save game from 16 years ago like I do, or 20 years ago if your in Japan then it will be pretty cool to transfer Pokemon you caught in your childhood in to a modern version of the game which will allow you to battle over the internet. What do I need to transfer my Pokemon save games from my real Game Boy cartridge or emulator to my 3DS? An SD card reader for your PC / Laptop. 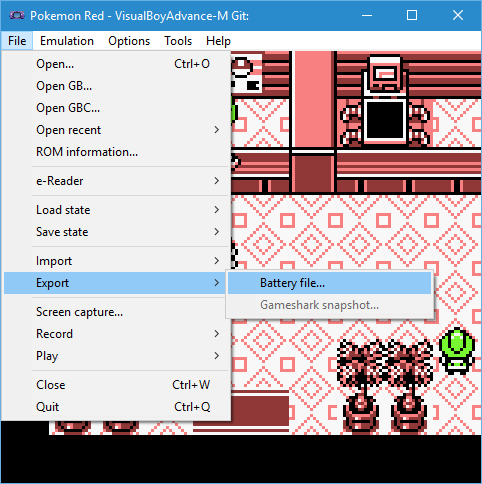 GameBoy emulator capable of exporting a "battery file" version of your save. VBA-M is capable of this and will be used in this tutorial. [Optional] A Game Boy Transferer 2, this is only required if you wish to use a save game from an original Game Boy cartridge, follow this link for instructions on dumping a save from a cartridge, then come back to this guide once you have your save. It's beyond the scope of this tutorial to teach you how to hack your 3DS, if your on firmware 9.2 or below you can hack your 3DS very easily. I have an old tutorial which goes through the process of hacking a 3DS or 3DS XL using the gateway flash card, however newer free solutions exist now, i'd suggest you look in to getting the RxTools Custom Firmware on your 3DS, you can auto boot in to this when the 3DS is powered on, so very convenient when setup. This tutorial presumes you have a hacked your 3DS and have basic knowledge of using a hacked 3DS, if you have a hacked 3DS and do not have SaveDataFiler installed, you can download it here, simply install the CIA like any other using BigBlueBox or another CIA installer. SaveDataFiler will then appear as an application on your home screen. 1. First you need to have started a playing the Pokemon virtual console game you wish to restore your old save game to, if you haven't simply start playing the game and save it after the introduction. 3. On the user tab scroll down until you see 01710, 01711 or 01712, these are the save games for your Pokemon games. The above is correct for the English (UK / US version of the games) it's possible the regional variations could have a different save ID. 4. Press "Y" to export the current save game to the SD card inside your 3DS. 6. All been well the save should export ok, if so press "A" and power the 3DS off. 7. Put your 3DS's SD card in the card reader so you can access it from your PC, you should see their is a folder called "filer" on the SD card and then a folder called "UserSaveData" inside that. 10. Open this folder and you should see a file called sav.dat this is your save game, you can actually change the file extension to a .sav and it will be usable with a Game Boy emulator. 11. Keep the above folder open, you now want to find the save game you wish to transfer to the 3DS. I have dumped my saves from my actual GameBoy cartridges using the Game Boy Transferer 2, however saves from emulators will also work perfectly fine. Note: the save game you are transferring must be 32KB (32,768 bytes). If your save game is larger it will show up as corrupted on the 3DS. 13. I will teach you how to ensure your save game is compatible, even if your save game is the correct size it will not hurt to follow the process below to be 100% sure. As in the screenshot above ensure your Rom / Save are named the same and load your save up in the VBA-M emulator, selecting continue on your save. 18. Now put the SD card back in to the 3DS, power the 3DS on and load SaveDataFiler again, this time selecting the SD tab and highlighting the savegame you wish to restore, if you have multiple the last save you backed up will be at the bottom of the list, which will likely be the save you want to restore. We can confirm this as we know "00001710" is the save ID for Pokemon Red. 21. That's it, you can now use your savegame from your original Game Boy cartridge or emulator on your 3DS's virtual console copy of the game! Above: My 16 year old Pokemon Red save in use on the Nintendo 3DS re-release of Pokemon Red, with the same save game still on my original Game Boy. I cant imagine too many people have their original Pokemon saves all these years on, i'm amazed the battery in my game cartridges are still working after more than 16 years. I actually dumped my save games from the cartridges 6-7 years ago, however my Pokemon Red and Yellow cartridges are still going strong today in 2016! I hope this helps someone who wishes to transfer a GameBoy save to the 3DS, to eventually import Pokemon in to Pokemon Moon and Sun once released. If you have any questions do ask and I will do my best to try and help, I hope I have explained the process in enough detail however. gatekeeper1122, HaxAras, Trebor and 1 other person like this. I don't have a hacked 3DS and my Pokémon Red, Blue, and Yellow safefiles on the cartridges got reset at some point as they're all 3 near the beginning of the game. The batteries appear to be fine though. This guide is well made and a very cool idea if you still have your childhood Pokémon on your cart! Btw, I bought Pokémon Blue on VC and am just going for the 151 Pokédex again, my bro bought Red so it'll be just like old days, lol. I remember back when I was young my friend’s used to always have rumours on how to get a Mew, a popular one was he was hiding under a truck by the SS Anne from what I remember. Pretty random to find a glitch did exist all these years later, not that any of us knew this back then. Yep, I've heard about that Mew glitch and just done it last week! And yes, Mew used to be very mysterious and cool back in the day. I remember reading about it on a random Geocities page that you could use a GameShark device and a bunch of codes to make Mew appear. I had a Game Genie instead, and was too young to understand most of the instructions on that page and mixed up GameShark and Game Genie, so I tried for several hours to do something with the Game Genie but noting happened, haha. I eventually managed to get a GameShark for my GameBoy, shops around here didn't really have stuff like that. I half think I persuaded my Dad to order it from a magazine for my birthday or something. Likewise i remember printing a massive list of codes off a Geocities website too. I can still remember the code to turn all wild Pokemon in to Mew! 0115D8CF - I guess I must have used that code a lot haha. So I followed this guide to the letter with my copy of Blue and my copy of Yellow. I ended up getting the notification for both games that my save file had been corrupt and then the only option was to start a new game. Any ideas? Also in window are you showing file extensions? if not you could have renamed the file save.dat.dat which would also cause issues. Hi, I had a huge problem for a while doing this, and I want to share how I fixed it. First of all the problem wasn't a corrupted file. After importing the game with the new sav.dat file, NOTHING changed on my save file, no corrupt save file, no error message in savedatafiler. The problem was that I was using the virtual console save state feature. Also, the virtual console would automatically do a save state when closing the game, and relaunching that save state when re-opening it, totally ignoring the save I just imported. I realized there was a difference between the usersavedata content in this thread and mine. In the folder where the save is located, besides my sav.dat file, I had 2 dat files "rsm1.dat" and rsm2.dat", instead of having the securevalue.dat as shown in the example. Those 2 files were actually the save state file the virtual console was using. Guess what I did... I deleted both of them. When re-importing, the game file was corrupted... BUT it kept my sav.dat file intact! Game started off from the beginning (instead of the resume save state), and I could use the ACTUAL "CONTINUE" of my sav.dat file. Thanks for sharing your experience MasterHoover, hopefully that will be of help with others! It's not something i encountered (i didn't think the Pokemon games allowed you to use save states) however thanks for taking the time to provide a solution for anyone else who has that issue! Does it work for real N2DS or only N3DS??? It will work on a 2DS, 3DS, 3DS XL, N3DS. Essentially it works on any of the 3DS / 2DS consoles. How do i get the SaveDataFiler into my Nintendo? I dont know. Is your 3DS hacked and running custom firmware? if not it needs to be. Follow the 3DS hacking guide here, then come back and follow this tutorial once the 3DS has been hacked. Cool, I didn't even realize you had made a guide for doing this. Last February a basically figured it out myself through trial and error. I can make a suggestion though. Since you need to use a much older computer with a parallel port to use the GameBoy Transfer 2, this may be pretty complicated for many people if they want to backup from their original cartridges. Basically how I backup my GB/GBC savefiles is with a Mega Memory Card, then restore it onto my EverDrive GB with the respective rom, which I then take the savefile from the SD card. People always say it's impossible to use a MMC with an Everdrive, but all you have to do is just keep the MMC switched off until you select the rom. After loading the rom, while you see the "GAMEBOY" boot screen, you switch on the MMC. Other types of flascarts may be easier to restore savefiles onto though, like those USB flashcarts. Unfortunately my MMC started crapping out and made it very difficult to use, and now it won't hold saves at all anymore, I assume due to overuse or age. It will get the job done though and backup all GB/GBC saves for anyone who buys one. I was just doing a lot of back and forth between cart and computer, and I think that wore it out. When I bought the MMC back in 2014, it cost me $7. Now they're unfortunately pretty costly since more people are wanting them to preserve their old GB/GBC saves. I did recently buy a BrainBoy back in September, which basically does the same thing as a MMC, but I'm not sure if I can use it on an EverDrive since it has no switch. I haven't tried it yet. They are still super cheap though, so it's at least worth a buy to preserve your save. However, someone told me about this device, which I think will backup your save directly to your computer without the need for a parallel port or flashcart/everdrive. All of these options will be somewhat costly if you don't already have any of these, but in the end it's much cheaper and easier than finding a computer with a parallel port. All last year I wanted to make a video guide of this sometime before SM or the PokeBank update were released, but I haven't had the motivation to spend time making it. InsaneNutter and HaxAras like this. I suggest buying one of these. I spent around 30 USD on mine and it works perfectly. It doesn't come with a USB cable but I was able to use my PS3's controller cable to back up my Pokemon Silver save directly to my PC. No mega memory or dealing with a parallel port or any of that nonsense and it's cheaper than the other option listed above. InsaneNutter and Deoxyz like this. Nice, that's much cheaper than the other cartridge reader I had linked. Thanks. I'd also recommend it over the other options as well. I'll buy one if I happen to need to dump GB/GBC saves again. I pretty much play those exclusively with the EverDrive now so I don't need to worry about batteries crapping out on me. Though I still plan to keep holding on to my cartridge collection. I don't think the BrainBoy would work with my EverDrive anyway without having a switch. A pretty unique way of getting saves off the GameBoy carts also. I do actually have one of those Mega memory devices too. I got that many years before the GB Transferer 2 to backup my saves incase the worst happened, knowing i couldnt get it on my PC at that time but it was better than nothing. The price of those now is really high compared to what i paid too, i think it was like £10 many years ago. Now that's a really nice solution! If you get time i dont suppose you could put a tutorial up for that? it would be great to show people a much more modern solution, and perfect to link to from this thread too. My GB Transferer 2 Tutorial was posted back in 2009, it wasn't exactly ideal then, but worked well. However i don't think you can easily purchase GB Transferer 2 today, even if you can i imagine a lot of people will have gotten rid of that old Windows XP PC with a parallel port. That USB solution looks perfect. It literally couldn't be more simple. I just installed the software and mimicked the settings on the screenshot and hit "read RAM" and it asks you where to save your file. I've never been good at tutorials. I always leave out info and poorly word everything. It's why I didn't wanna post the ROMS for these threads. Is there any reason why it only bring over 1 Box from the Pc over? I've transfered from the emulator to 3ds virtual console and it only show i have one PC box filled and the rest are empty? Poke Transporter will only transfer Pokemon from Box 1, so you need to transfer Box 1 then move another set of Pokemon in to Box 1 to transfer. If you mean you can only see 1 box of Pokemon in the save then that's a strange one.